At an average altitude of 13,000 feet, the Tibetan plateau is also known as the roof of the world. Despite numerous years under Chinese occupation, the people of Tibet refuse to be subjugated by China. China aims to change the character, culture and identity of Tibet. Today, in their homeland, Tibetans are outnumbered by a huge population of Han Chinese. Tibetan architecture is a mix of Indian and Chinese influences. Its most unique feature is that many homes and monasteries are built on elevated, bright sites, always facing south. More often than not structures are built from earth, cement, rocks and wood. As not much fuel is available for lighting or heat, most Tibetan roofs are flat to help conserve heat. Homes also contain numerous windows, to allow natural sunlight to enter. Lastly, the walls are built with a slight inward slope as a precaution against earthquakes, which are frequent. 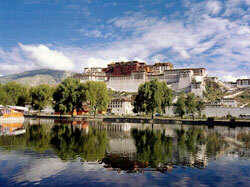 A wonderful example of Tibetan architecture is the former residence of the Dalai Lama, the Potala Palace. With over a thousand rooms, this magnificent, 13-storey home houses statues of the Buddha, portraits of past Dalai Lamas, 10,000 shrines, chapels and a comprehensive library of Buddhist scriptures and writings.